This publication tabulates the value of Louisiana agriculture in 2017. Agents and specialists of the Louisiana Cooperative Extension Service and other agencies — both private and public — compiled the data. Their analysis focuses on the animal, forestry, fisheries, plant and wildlife commodities that constitute our vital agricultural industries. Agricultural and natural resource industries contribute significantly to our state’s economy with economic benefits and job creation from value-added processing in urban and rural communities throughout Louisiana. With the effects of excessive rainfall and flooding during 2016 still fresh on the minds of most producers, there were significant concerns about the 2017 production year, which started in a similar fashion. The 2017 calendar year began with mild temperatures and optimal soil moisture. This helped spur early planting for many commodities and helped establish strong yield potential early in the growing season. However, a continuation of heavy rainfall throughout much of the state began to erode these nearly ideal growing conditions. Rainfall from April 2017 through August 2017 was nearly 16 inches higher than average (a 72 percent increase). Tropical Storm Cindy, which hit the state in June 2017, and the remnants of Hurricane Harvey, which hit in late August 2017, helped add to those rainfall totals and brought heavy winds and storms that are believed to impact pollination for some crops and impact quality for others. While the significant rainfall did help limit irrigation needs and costs, it also likely interfered with timely applications of inputs and further hindered production potential. Fortunately, however, weather began to improve dramatically in September, and favorable conditions lasted for most of the remainder of the year. For some crops, this helped limit impacts and allowed for record or near-record yields. However, for most crops, the improvement in weather conditions was not enough to fully capture the production potential that existed at the start of the growing season. For other crops, the improvement was too late to reverse both the yield and quality stresses from the wet period. Despite the challenging weather conditions in 2017, yields for most row crop commodities showed improvement over the weather-impacted levels of 2016. Leading the way were sugar yields that reached record levels and were nearly 9 percent higher than 2016. Corn and soybeans also experienced significant yield increases in 2017 versus the previous year and were within a few bushels of reaching record levels. Other commodities experiencing increases in yield in 2017 were rice, wheat, sweet potatoes, peanuts and many vegetable crops. For cotton and grain sorghum, the good start to the growing season was not enough to overcome the difficulties caused by the excessively wet summer and saw yields fall by 6 and 4 percent, respectively, from the previous year. While the overall production year could generally be viewed as a success for most commodities, the same could not be said for the marketing environment during 2017. For many commodities, the 2017 calendar year saw a continuation in the trend of the last three to four years of low commodity prices. Increasing supplies and stocks have continued to outpace demand and place downward pressure on prices. Row crop commodities that experienced lower prices for the calendar year 2017 included rice, soybeans, corn, grain sorghum and sweet potatoes sold in the fresh market. Cotton and wheat prices were up during 2017 as lower supplies caused by lower acreage or weather-related yield reductions helped to support prices. Sugar prices were also up slightly as supply and demand conditions continued to support that market despite increased production. Unlike the row crop sector, the overall price scenario for the livestock sector had a much more positive tone for the 2017 calendar year. While still at significant discounts from levels seen earlier in the decade, beef cattle prices seemed to stabilize somewhat in 2017 after a couple of years of declining prices. While prices did not increase across all types and classifications of cattle, prices for heavier feeder steers and heifers were marginally higher as cheap feed costs and strong beef demand helped to counteract the impacts of higher cattle numbers and increased beef production. Despite the marginally higher prices, profitability in the cattle industry remains significantly lower than the levels experienced earlier in the decade. Lower profitability is likely being reflected in the lower prices being seen for replacement and cull breeding cattle. Prices for sheep and goats were also mostly higher in 2017 as lower overall U.S. production and stable demand helped to support prices. Milk prices were also marginally higher during the 2017 calendar year because of stable production and slightly improved demand. While the higher milk prices are welcomed, they remain at levels that will continue to place pressure on the profitability of dairy operations and will likely not be sufficient to break the trend of decreasing dairy numbers in the state. Finally, broiler prices were also higher during the 2017 calendar year as increased demand help support prices despite higher production levels. Prices for the fisheries and wildlife enterprises were mostly mixed. Prices for both farm-raised and wild-caught crawfish were lower than the previous year as the continued expansion of crawfish production begins to outpace still strong demand. Likewise, prices for both farm-raised and wild-caught alligators were lower as higher production and stagnant demand pressured prices. Other fisheries commodities experiencing lower prices during the reporting year were crabs, oysters and soft-shell crabs. For other commodities, including freshwater and saltwater finfish, prices were higher than the previous year. Likewise, prices for menhaden were also reported slightly higher, and shrimp prices were nearly 12 percent higher than the previous year, ending the trend of the previous three years of lower prices. While the production and price challenges faced by individual commodities and producers did vary considerably in 2017, the overall improvement in production levels and the ability for many commodity prices to stabilize and show slight improvements helped to increase the total economic activity associated with the Louisiana agriculture, forestry and fishery industries. 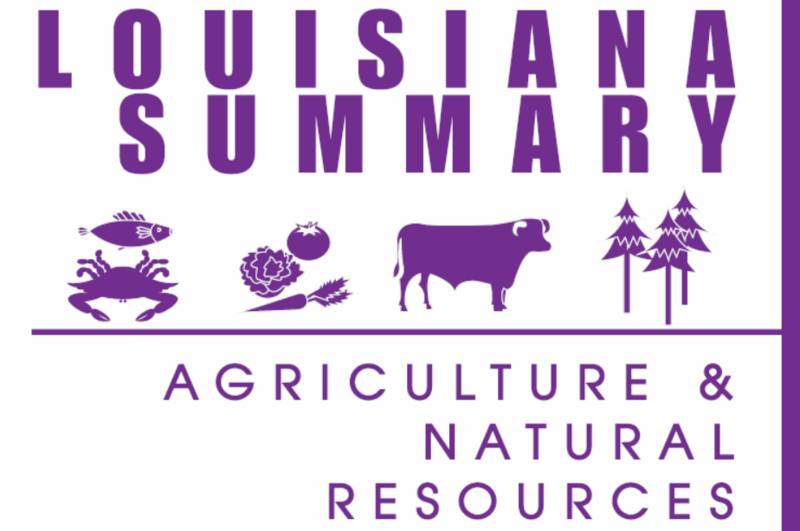 The total gross farm value (the amount of revenue estimated to be generated by producers from the sale of their commodities) for the Louisiana agriculture, forestry and fishery industries was up over 7 percent from the previous year. Leading the way for the increase were the plant enterprises, which saw their collective gross farm value increase by more than 9 percent from the previous year. A combination of higher acreage and stronger production levels more than offset stagnant prices. Significant increases in gross farm value for cotton, forestry, soybeans, sugarcane, sweet potatoes and vegetables more than offset reductions in feed grains, fruits and rice. The collective gross farm value of the fisheries and wildlife enterprises was up more than 7 percent, with increases in the freshwater and marine fisheries leading the way. The animal enterprises saw the smallest increase in the collective gross farm value, with about a 3 percent increase. Increases in the gross farm value of poultry, sheep and goats were mostly offset by decreases for beef cattle, milk and horses. Commodities produced by agricultural producers are cleaned, processed and packaged at the next stages of the marketing channel. These value-added activities create additional economic activity over and above that defined by the gross farm value. In 2017, these value-added activities were estimated to have an additional economic impact of $5.4 billion. Taken together, the gross farm value and value-added activities were estimated to have a total economic impact of nearly $11.8 billion. This represents an increase of more than 7 percent from 2016 and is the first year-over-year increase since the 2014 year. Given the level of economic activity that the state’s agriculture, forestry and fishery industries continue to generate each year, it is undeniable that they continue to be major contributors to the overall state economy. Cutting-edge research programs and extension education and outreach efforts of the LSU AgCenter remain critical to sustaining these economic benefits. Many Louisiana communities depend on agriculture, forestry, fisheries and wildlife for local jobs and their economic well-being. However, for those who work in it day in and day out, agriculture, forestry and fisheries are far more than a business, a major job contributor and an economic engine. It truly is a way of life. Families have lived on many of these farms, forest lands or fishing villages for generations, following a preferred way of life even though it means hard work, long hours, high risks and sometimes low incomes.